In Congress, Democratic leaders in the House and Senate are moving several bills that would improve how runaways are tracked by the police, increase spending to provide them with social services and promote methods for earlier intervention. The Government Accountability Office, an auditing arm of Congress, initiated an investigation in December at the request of the Senate majority leader, Harry Reid, Democrat of Nevada, and Charles E. Schumer, Democrat of New York, into whether police departments are handling runaways properly. Lawmakers in at least 10 states have proposed or passed bills in recent months that focus on runaways by extending outreach efforts and shelter options and changing state reporting requirements so that youth shelters have enough time to win trust and provide services before they need to report the runaways to the police. 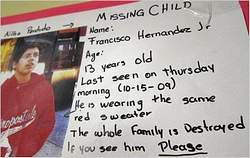 The bill, co-sponsored by Representative John Conyers Jr., Democrat of Michigan and the chairman of the Judiciary Committee, also requires the police to provide anyone who reports a missing person with information about the services provided by the National Center for Missing and Exploited Children and the National Runaway Switchboard. In many cases, the police said, they often did not take reports about runaways as seriously as abductions, and families were often unaware of other resources. If anyone asks me what would be the greatest accomplishment that anti-human trafficking advocates have made in 2009, I would point to the legislators implementing new laws to better assist runaways and child prostitution victims as mentioned above. The experts and researchers have recognized the close connection between domestic minor trafficking and problems with runaway youths in the U.S. for decades. However, it is only recent that they were able to capture the attentions for the Congress. Often, children run away from their own homes because of feeling neglected. ( For more information on the root causes of runaway youths in the U.S., click here). Though the state seldom will be better able to parent a child than the child's own parents. Nevertheless, it's valuable that law makers are paying a little more attention to the needs of the American youths who are at risk of being made human trafficking victims by other greedy and immoral Americans -- and that is a fruit of awareness raising efforts by advocates. Labels: Child Trafficking, Children, CSEC, domestic minor trafficking, Legislation, U.S.